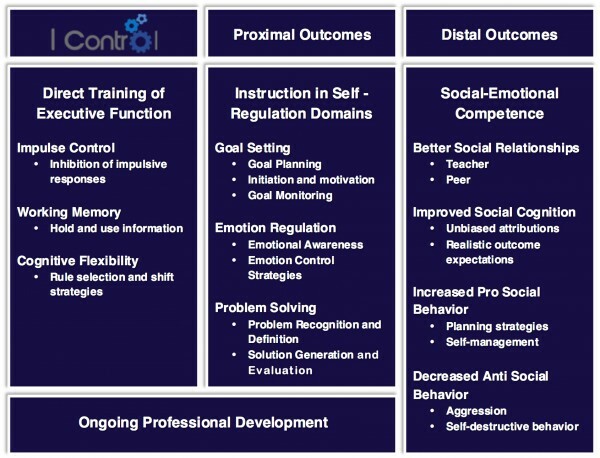 I Control is a theoretically grounded intervention design to tap self-regulatory mechanisms collectively known as executive function (EF) that plays a role in both positive and negative social-emotional functioning. 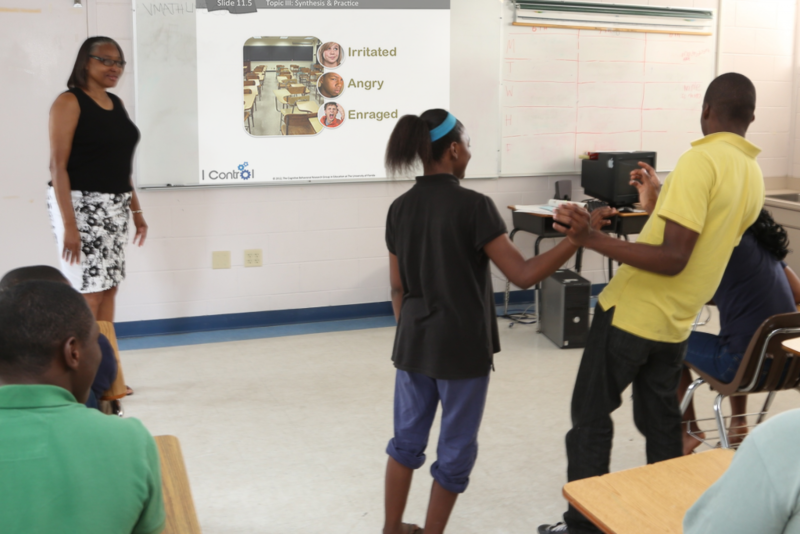 The goal of I Control is to foster self-regulation and improve social-emotional outcomes for middle school students with emotional and behavioral disorders (EBD). I Control taps EF skills such as inhibition of impulses, initiating, planning, strategy switching, and maintaining information in working memory. Our Theory of Change illustrates how these self-regulatory functions are fundamental to goal setting, emotion regulation, and problem solving skills which, in turn, contribute significantly to social-emotional competence. 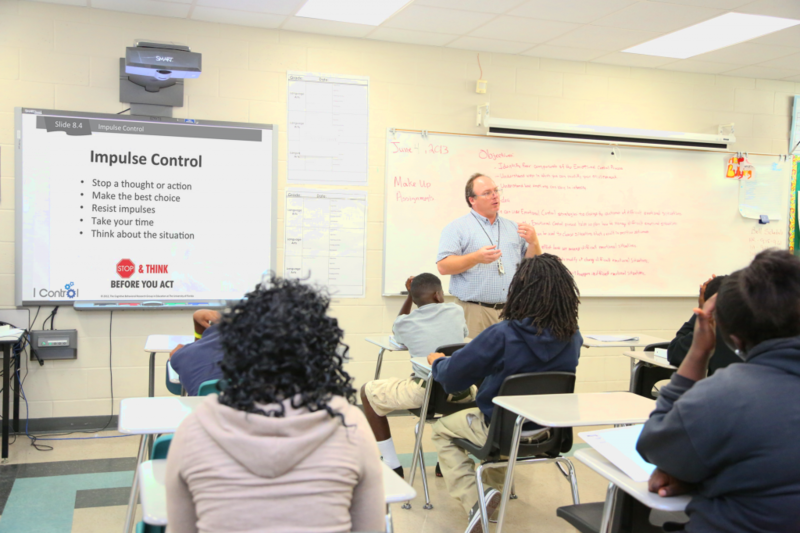 We are developing I Control in middle school classrooms with the aid of teacher and student feedback. We are monitoring and evaluating lesson implementation using observational data and continually adjusting curricular components to enhance ease of use, accuracy of implementation, and to maximize the effects the curriculum may demonstrate for improving self-regulation and social competence of children with EBD. I Control is funded by a Goal 2 development grant with the National Center for Special Education Research, Institute of Education Sciences. This resource is for participating teachers in our federally funded efficacy study of I Control by the U. S. Department of Education. Using the password provided, you can find access to the I Control powerpoint slides and Job Aids for each lesson along with the Brain Training Lab link for students. I Control is a tertiary intervention to teach students self-regulation skills through the use of graphic organizers, visual supports, and a variety of hands-on activities. Teachers can deliver I Control content through instructional techniques such as direct instruction, guided practice, and group discussion with teacher feedback. Students are provided opportunities to practice I Control skills through interactive role-plays using real life scenarios.